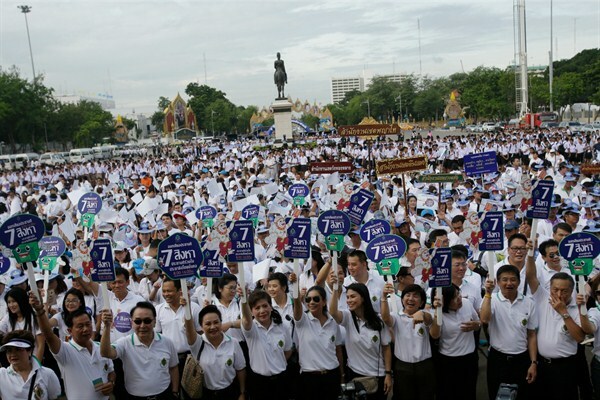 Government workers at a rally to encourage Thais to vote in the constitutional referendum, Bangkok, Aug. 4, 2016, (AP photo by Sakchai Lalit). In what could be described as a self-inflicted wound, Thais voted Sunday to accept an undemocratic constitution in a nationwide referendum. According to the preliminary count collected by the Election Commission, based on 94 percent of the votes cast, 61.4 percent of Thais were in favor of the constitution, while 38.6 percent rejected it. A significant shift in the results isn’t expected with the final, official tally on Aug. 10.